A couple weeks ago, I talked about my Bucket List and began in the world of football. Now, let’s move onto basketball, which includes my favorite group of stadiums: College Basketball Arenas. I love the diversity of these facilities as they come in all different shapes, sizes and ages. Note that the Basketball Bucket List below only features 2 NBA arenas as those sterile, manufactured places just don’t do it for me. Dee Glen Spectrum – Utah State Aggies: So sad how far the Spectrum has fallen in recent years. The student section is nowhere near doing stuff like this. Hope they come back to glory soon. Hilton Coliseum – Iowa State Cyclones: Hilton Magic. Memorial Gym – Vanderbilt Commodores: Like a theater. There may not be a more unusual college basketball arena than Vanderbilt’s. Awesome. Pauley Pavilion – UCLA Bruins: I’ve always been blah about UCLA and Pauley, but, history. Phog Allen Fieldhouse – Kansas Jayhawks: Rock. Chalk. Jayhawk. Cue goosebumps. Rupp Arena – Kentcucky Wildcats: Generic downtown arena in a shopping center. But it’s Kentucky! Staples Center – Los Angeles Lakers: It’s LA. It’s The Lakers. Gotta go once. The Pit – New Mexico Lobos: Yes, literally built in a Pit, New Mexico has always been at the top of basketball places to visit. Viejas Arena – San Diego State Aztecs: Viejas looks like a Pit as well with the no-frills floor to top seating. The Show is an entertaining student section. Williams Arena – Minnesota Golden Gophers: The Barn is similar to Vanderbilt in that no arena is like it. In the world of basketball this season, years of anxiety have finally disappeared in Sacramento as the Kings move in to their new digs, ensuring that they will remain in Sactown for years to come. The arena formerly known as Arco has given way to the Golden1 Center, a facility right in the middle of downtown. 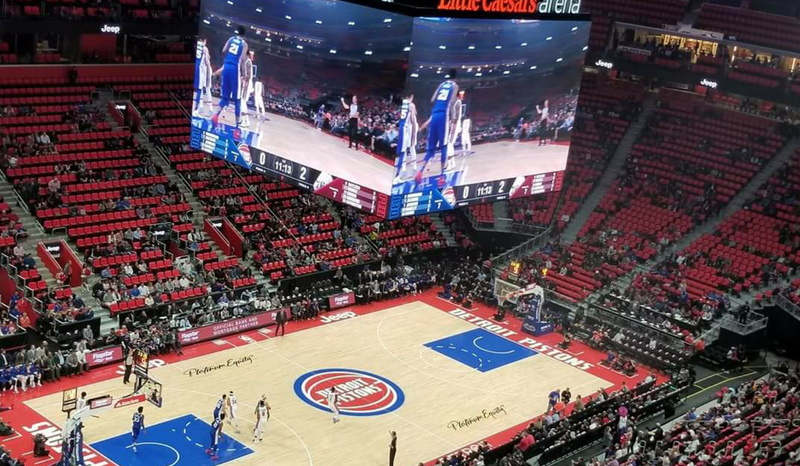 This new arena continues the trend for California stadiums to lead the way in technological design, both inside and out. By all accounts, it seems like AECOM did a terrific job as the first few months have been received well, though a couple people falling on the stairs in the upper deck is not good. With the Kings now in Golden1, it looks like the days of functional arenas built in the 70s and 80s is just about over as Milwaukee and Detroit are soon to depart as well. Moving down to the D-League, more NBA affiliations come on board as the Long Island Nets and Windy City Bulls debut this season. If you read this site enough, you’ll know how much I loathe those moves. The Bulls at least will be at the Sears Center in Hoffman Estates, while the Nets will probably play in front of 137 people at Barclays. A little better is the arrival of the Greensboro Swarm and even though the colors/nickname have nothing to do with Greensboro and everything to do with the Hornets, at least they are in another city. The Swarm will play in the Greensboro Coliseum. A couple of team moves: Utah’s affiliate in Idaho has gone to team headquarters as they set-up shop in the Salt Lake City area, specifically the 5,000-seat arena at the Community College in Taylorsville. Lastly, a relocation I do like is the one that involves Bakersfield as the Jam (who played in what looked like a YMCA gym) have gone to Prescott Valley and a legit minor-league arena. The name could use work: Northern Arizona Suns. Argh, why is it only baseball that embraces local community! In College Basketball…Well, Hello Dakotas! The two new arenas opening this year come to us from the Northern Plains and both are significant upgrades. 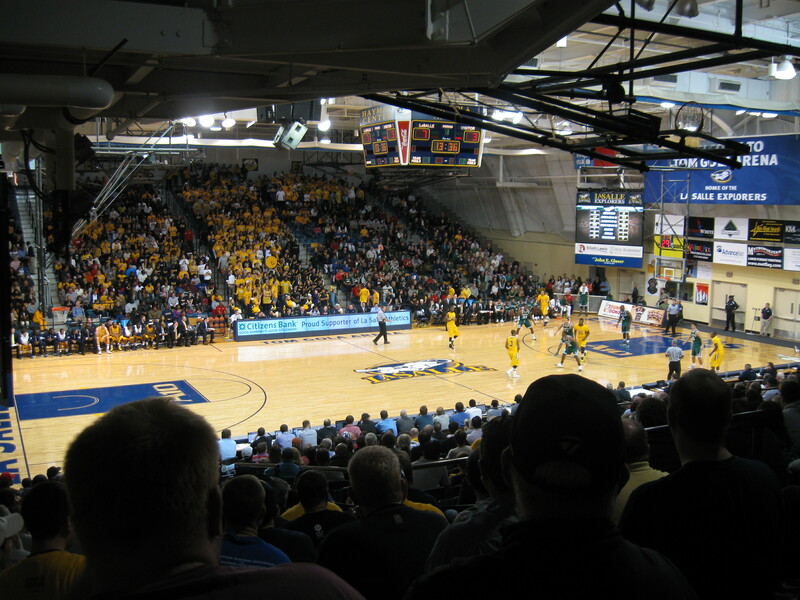 In Fargo, North Dakota State University moves in to a new basketball home for the Bison: The Scheels Center (not to be confused with the city’s main indoor facility: Scheels Arena, where the Fargo Force plays). It’s nice, but it does feature telescopic seating. Pictures seem to indicate that the new Sanford Coyote Sports Center at the University of South Dakota has a nicer interior as there is plenty of red school color with the permanent seating in what looks like an intimate seating design close to the court. There were some arena renovations this year as well, most notable is a place that is an icon in the sport: Indiana’s Assembly Hall. 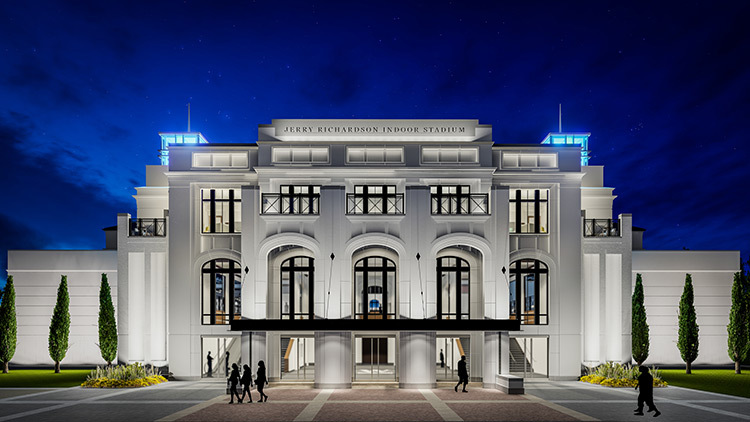 A $40 million gift from Cindy Simon Skjodt led to needed renovations and designers did a terrific job of focus efforts on maintaining the remarkable atmosphere and seating, while still producing upgrades. Their focus on that preservation is evident, while their upgrades include a beautiful new lobby/atrium that highlights Hoosier history. Great job treating one of the special and unique places in the sport with care. Other renovations debuting this season occur at Florida’s O’Connell Center and at the Cajundome down at Louisiana-Lafayette. After spending the week getting back into college basketball and then watching a good chunk of the season’s start Friday evening, I really got the itch to head to a game. Usually, this process is a thoroughly thought-out one, however this venture was not. After scouring the schedules, I saw that La Salle was playing at home Saturday afternoon. That game started at 2 PM, then I found Penn was playing Temple in the Palestra at 5 PM. Oh Yeah! The wheels started churning and quickly a doubleheader was in place, though time and tickets were in question. This is highly, highly unusual for me since I am super organized, but on a nice Saturday with nothing going on, spontaneity got a hold of me. I also likely decided to do it since these weren’t official visits. I have been to the Palestra before (Visit #94) and La Salle’s Tom Gola Arena, falls just shy of making The List as the capacity is 3,400. Anxiously, I started the two hour journey down to North Philadelphia, for me to get to. An hour is spent on Route 31, a single lane road most of the way with lights and my biggest pet-peeve, traffic circles. After a brief stint on I-95, I got on US-1, the Roosevelt Expressway, which was the best route into La Salle. This was my first time on that road and hopefully it is my only time. A split, semi-highway that is constantly stop and go thanks to traffic lights. I gave myself plenty of time and made it to the shopping center that is used for game-day parking about an hour early. The Explorers made the Sweet 16 last year and this was their first home game, which included a banner-raising ceremony, so I thought a sell-out was possible. I did a powerwalk to the building’s tiny ticket window and was able to get a single seat scrunched in the upper end of W5. With that being taken care of, I went back outside to take a look at this arena and snap photos. It is underwhelming to say the least for a building that opened in 1998. After a small entrance, fans walk upstairs to the floor of the arena. On the right is a lone foyer that hosts a concession stand vastly overwhelmed at times. The arena features sideline seating only and once you get to the top, various overhangs partially obstruct views. After surveying the scene, I went up into my little corner of the facility and ate a snuck-in turkey wrap while awaiting what I thought would be a solid game: LaSalle vs Manhattan. My rooting interests sided the Jaspers way because they are in the MAAC, one of 16 geographically and sensibly organized conferences that I will be following this year. The game started ugly as most season-opening contests do. Missed shots and turnovers were common, but by the end of the first half, both teams started to put it together. It was tight much of the game, but late in the second half, Manhattan started to push the lead and George Beamon played like a stud. Down ten with four minutes left, La Salle fought back and Tyrone Garland nailed a three with 13 seconds left to tie the game. It went into Overtime and this time, it was La Salle’s turn to blow the lead. With the Jaspers down three, they pressed the Explorers into a turnover and the ensuing lay-up cut the lead to 1. After split success at the line on the other end, Rhamel Brown tied the game with seven seconds left and we would go to Double Overtime! In that session, it was all Jaspers and they went back to Riverdale with a 99-92 win. This exhilarating game was made all the better by the great crowd. Kudos to the La Salle home fans who filled most of the place up and were very vocal throughout. They knew when to get on their feet and it was a surprisingly knowledgeable and passionate group. The noise in the arena when Garland nailed the tying three was terrific. Fans in my little section were also a great group, conversing with each other and friendly with the traveling Jasper fans. Also, a nod to those fans from Manhattan as there were probably about 500 that made the trip. Through all of this excitement and craziness, I kept looking down at my phone for the time. It takes twenty minutes on a good day to get to the Palestra and when La Salle had the ball down three, it was 4:00 PM. Unfortunately, overtime meant making it to Penn-Temple would be dicey and then double overtime sealed my fate as the game ended at 4:45 PM. I think the long game was a blessing in disguise because I later saw in the box score that the Palestra was sold out. Though Big Five basketball is one of my favorite sporting events to see live and the Palestra is an incredible place, probably a good thing I didn’t head to West Philly. I headed home from Tom Gola completely satisfied after that amazing game (I love college basketball!). Thinking about the arena on the trip back, I started wondering if this should be an official visit. Though it fell 100 seats short of my capacity cap, it felt bigger than other college venues that I have been to on The List. After going back and forth, I decided to make an exception and put it on there as the clincher was that all of the other basketball venues in the ever-changing Atlantic 10 qualify (five of which I have now been to). An official review thus will be forthcoming on what was one of the most unexpected visits that turned out to produce arguably the best game I have seen in 143 venues. Though this post is kind of late, I wanted to get something up before it becomes irrelevant. By now, you’ve probably gathered I love college basketball and this is the penultimate fortnight with all of these conference tournaments as everything gets whittled down to a nice, tidy 68 teams in bracket form. The conference tournaments can be just as fun as the main tournament, especially those where the only way to get in to the dance is by winning your league. 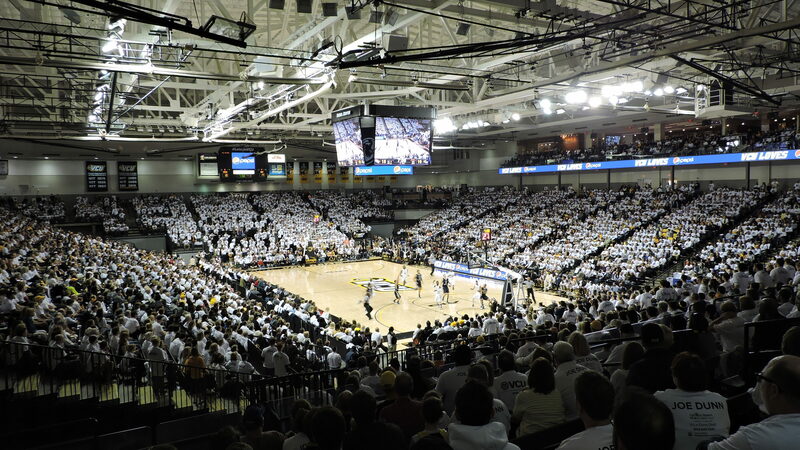 The venue is important too and though I enjoy when the home team hosts and a raucous environment ensues (along with a possible court storming), a conference tourney in my opinion should be held at a neutral (or almost neutral) court. Some have it right the way it is now, but others could use some help on where to place their tournament. So below are some thoughts on which arena should be the home for each of the 31 conference tournaments. 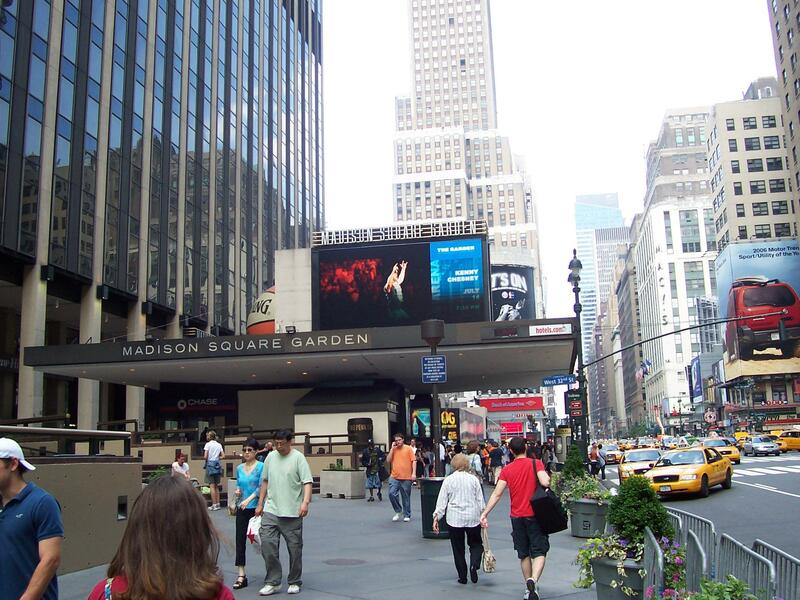 And if the Ivy had one, I’d put it in MSG. …….weekday afternoon games when the arena is 20% full. 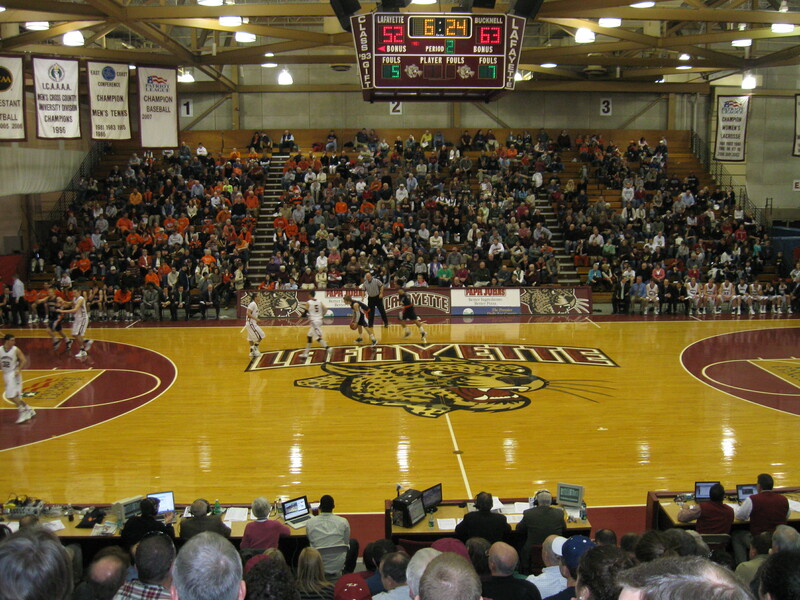 I’m ashamed to say the basketball arena at Lafayette College in Easton, PA alluded me the last few years. Not sure why last Saturday was my first appearance there as the drive is relatively short. This was the second straight Patriot League facility and fifth overall visited. The 3,500 seat Allen P. Kirby Sports Center first made its appearance on The List last year, when I lowered the minimum capacity from 4,000 to 3,500. Sitting up on College Hill, the small private school rises well above the city and provides a nice birds-eye view of Easton and the Delaware River as a winding road brings you to the top of the hill. The football stadium parking here was awful and for basketball it wasn’t much better with one small deck available, but luckily that was enough and it was no problem getting to. Speaking of football, it was a very strange walk to the Sports Center as you walk through Fisher Field. Despite the cold and wind, it was great because that gave me the opportunity to walk the stadium and take some pictures that I didn’t get during my first visit there in 2006. The Kirby Sports Center has a nice, modern exterior and concourse that was aided by renovations. The opening foyer looks more like a student union as opposed to an arena, but once you push in a little further, the hallway before entering the gym is nicely decorated with Lafayette maroon on the walls and complete with several trophy display cases. The gym itself is meh. All wooden bleachers with three sides of seating, while at the other end is a food stand before it opens up to the rest of the “sports center” (indoor track and other training), giving it a less than appealing look and feel. Lafayette-Bucknell was the game I saw and had an interest for, as I am a big fan of the lower-level in college basketball. Both teams were 2-0 coming in, but Bucknell is the prohibitive league favorite and they showed it. Hardly ever trailing they outclassed the Leopards and Mike Muscala was impressive scoring 27 with ease. The Bison won 79-65 with a 9-2 run to start the second half pushing them to the insurmountable lead. It was nice seeing a good crowd on hand (a legit announced attendance of 2,515) and the fans all were reading the free program as they were into the game. They seemed to know a lot about the team and league, too bad Bucknell never really gave them a chance to be more vocal.